Do different generations view the industry differently? 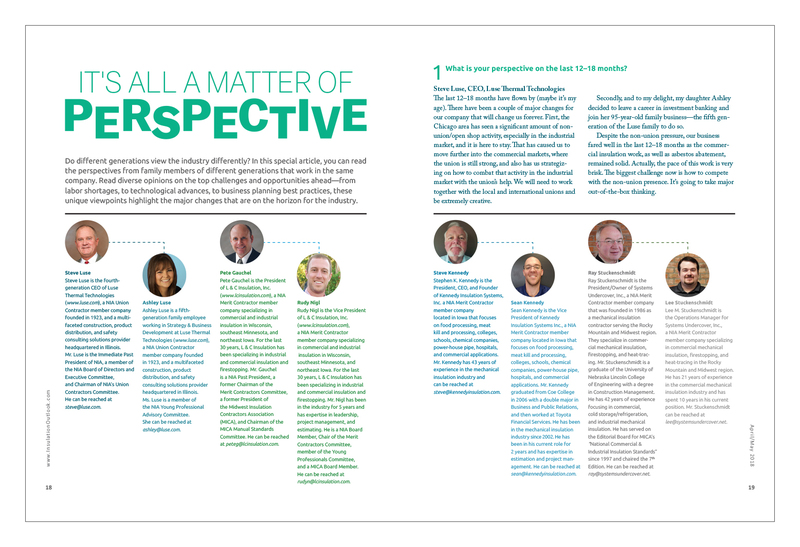 In this special article, you can read the perspectives from family members of different generations that work in the same company. 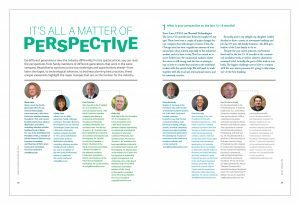 Read diverse opinions on the top challenges and opportunities ahead—from labor shortages, to technological advances, to business planning best practices, these unique viewpoints highlight the major changes that are on the horizon for the industry. 1. What is your perspective on the last 12–18 months? The last 12–18 months have flown by (maybe it’s my age). There have been a couple of major changes for our company that will change us forever. First, the Chicago area has seen a significant amount of non-union/open shop activity, especially in the industrial market, and it is here to stay. That has caused us to move further into the commercial markets, where the union is still strong, and also has us strategizing on how to combat that activity in the industrial market with the union’s help. We will need to work together with the local and international unions and be extremely creative. Secondly, and to my delight, my daughter Ashley decided to leave a career in investment banking and join her 95-year-old family business—the fifth generation of the Luse family to do so. Despite the non-union pressure, our business fared well in the last 12–18 months as the commercial insulation work, as well as asbestos abatement, remained solid. Actually, the pace of this work is very brisk. The biggest challenge now is how to compete with the non-union presence. It’s going to take major out-of-the-box thinking. Pete Gauchel, President, L & C Insulation, Inc. I feel that the last 12 to 18 months have been great for the construction industry. With the election of Donald Trump we now have an administration that is pro-U.S. business and pro-labor at the same time. One of the highlights is the tax breaks and tax cuts that were passed by the Trump administration. It is bringing trillions of dollars back into the United States, much of which will go into construction projects. The bumps in the road are the lack of a young labor force that is willing to enter the construction trades. Our business fared well in 2017 and the work backlogs we are seeing for 2018 are very strong. The challenge, again, is finding a new, young workforce. Rudy Nigl, Vice President, L & C Insulation, Inc. The overall construction market seemed to be booming over the last year. In the commercial world, companies/people have money to spend and confidence in their investments, which led to a large growth in opportunities and projects across our work area. The main positive development from the last year was the abundance of opportunities to find work—the primary difficulty was finding enough qualified/motivated installers to fill the need for the work contracted. We did have a great year with a lot of stellar customers, and also another very safe year without incidents. As our company is expanding, we are constantly facing the challenge of finding the right relationships in new markets. With that said, the opportunities are plentiful if you do things the right way and offer a quality product at a quality price. Steve Kennedy, President and CEO, Kennedy Insulation Systems, Inc. The last 12–18 months were steady to slow. Health care and business insurance were out of control, escalating every year since 2010. 2018 looks a lot better for us. We changed health insurance and have a new health-care model that gives us flexibility on premiums for each employee. We found a business insurance program that was, finally, very impressed with our 0 injuries for the last 25 years and a low experience modification rate (EMR). My advice to other industry members is to not get stuck with the same business and health insurance companies year after year—take quotes every 4 years. Making a change can produce significant savings for your company. Ray Stuckenschmidt, President, Systems Undercover, Inc.
Lee Stuckenschmidt, Operations Manager, Systems Undercover, Inc. Overall, there is a large amount of work available and being completed while the market seems to be maintaining an absurdly high competitive level. It is a mixed bag on how the local industry is faring; we have been seeing a large number of contractors cutting corners and lowering their overall quality and workmanship in exchange for price, market share, and in order to complete projects. At the same time, some of the mechanical contractors in our market have recognized that low-quality work is being performed. From those that have recognized it, some are continuing to put themselves at risk by buying into cheap (though not inexpensive) options and taking the risk that they will not be caught. Other mechanical contractors are continuing to use quality insulation contractors who put an experienced and capable crew out there. The pace on projects always seems to be speeding up and competition in and out of the market is strong. Invariably, there is a lot of talk about the low-skill contractors struggling to complete projects. 2. What are your predictions for the next 12–18 months? I think the next 12–18 months will be similar to the prior 12–18 months. Non-union companies will become a bigger influence in our area and will probably start to affect the commercial markets as well. As has happened all over other parts of the country, we will learn to adapt or get out of the insulation business. As a 95-year-old union insulation contractor/distributor, we will figure it out so my daughter Ashley and her coworkers can take us to 100 years and beyond. Seeing her and the next generation of younger folks now entering our business is very exciting to me and all of the other employees. I think the next 12–18 months will show an explosion in the construction industry. The biggest challenge is to find new young people to join the construction industry. We are very excited about the next 1–2 years. We will always have the challenge of finding enough people to fill all needs in the field and office, but that is a good problem to have. We are very excited about continuing to grow in new markets and expanding our business of top-quality work and customer service in a safe environment. construction work all over the United States. The problem is that President Trump is making drastic changes so fast and furious that it scares people. In my opinion, past Presidents were more focused on lobbyist contributions instead of the welfare of the American worker, and we welcome a change in priorities. Even if the economy slows, the “rate of business” continues to accelerate—this model will continue to present opportunities for the industry to examine and profit from if its members choose to see it as such. We expect to be searching for qualified employees to complete our work commitments. We also predict more/continued government oversite and intervention in activities we are already capable of handling. Lastly, I predict the trend of offsite pre-fabrication will continue to grow. As long as the oil prices stay at their current levels, or increase, my expectation is that the market will become even more pressured and competition will remain highly elevated. Personnel needs are going to get tighter and the availability of contractors to complete work will become a real issue. Hopefully general contractors and mechanical contractors will recognize that they are squeezing an already tight pool of insulation contractors. 3. What are your top priorities for 2018? My top priority for 2018 and beyond is to continue teaching our emerging leaders all I can about our great industry and business in general, and let them chart their own course. We learn from doing and even making mistakes along the way, and we must let our new young leaders have that same experience while giving them the chance to introduce new technology and ways of thinking to a mature but ever-changing and challenging industry. Our top priorities for 2018 involve operational improvements and human capital development. We believe that a vision of operational excellence will propel our company into the next stage of growth. We have committed to strategically investing resources into process improvement across all areas of our business: business development, estimating, project management, field operations, and administration. Second, we are committed to developing a deep bench of skilled estimators and project managers. It’s important for us to dedicate additional resources to recruiting the best talent, making quick hiring decisions, and effectively onboarding new team members. Our top priorities for 2018 are to find new employees that will learn the trade and pass on many of the skills of our older mechanics. We are also looking to grow our company with some of the good new talent that is out there. Our company’s top goals are to grow by 10–15% in revenue with the addition of new markets and new relationships/customers. We are working on expanding our reach, our knowledge, and our craftsmanship to old and new customers. The industry needs to keep focusing on connecting with spec writers, engineers, and architects who use our products and services in projects. Safety also needs to remain a top priority throughout the industry. Our top priorities are managing business activities towards profitable volume and maintaining a safe work environment. Our top priorities are educating young engineers, pushing the importance of not squeezing insulation into the last possible gap in the schedule, and promoting localities to develop true inspection processes for our trade. 4. Do you think recent legislation will affect the industry? Have you seen local and state changes? The recent legislation during the Trump presidency has been very good for all of our Luse Holdings businesses, and it will continue to positively affect our industry and business. On a local level, Chicago and Illinois are still struggling, but I hope we will figure it out sooner than later. Politicians have to stop playing games, reach across the aisle, and do what’s best for the people and employees of our state, not themselves. I think the recent legislation will give a huge boost to our economy and our construction industry. There has also been a trend toward cutting ridiculous regulations that would strangle projects to death. I think the new tax bill has already positively affected our company. Most employees are seeing a little more on their paycheck, which is a positive for everyone. Immigration policies don’t affect us directly. The state of Wisconsin has eliminated Prevailing Wages and made the state Right to Work within the last 2 years. This has changed the way jobs have been budgeted and staffed. Sean Kennedy, Vice President, Kennedy Insulation Systems, Inc.
We have yet to see much, if any, in the way of changes from recent legislation in Iowa. We will have to see what becomes of the trade talks and what type of impact that will have. We have noticed a gradual adoption to more updated energy codes in the past year. One of the changes we like to see is when engineers put an installed R-Value for the sheet metal. We regularly call engineers and tell them that the product they are specifying does not meet the correct R-Value, or the R-Value that they put in the specs is not an installed R-Value. The tax bill is a positive for us—we are able to keep more of our profits to reinvest, build equity, and reward employees. Health care has a ways to go—if we are going to have government-mandated health care across the board, all employers (regardless of industry) will need to develop a minimum coverage game plan. Today’s randomly implemented requirements (with the Medicare option) are not cost competitive. In regard to immigration, I believe we should build the wall, enforce laws already in place, and send those who have already been given deportation notices back home. I believe that the tax bill should loosen up funds to start a few larger capital projects. With the current state of politics, I don’t really have high hopes that anything positive will be reached any time soon. 5. How do you think technology is affecting the industry? Technology continues to positively affect our industry as well as the construction industry as a whole. GPS vehicle tracking, computer take-off and estimating programs, customer-relationship management (CRM) software, and iPad/iPhone apps for our field forces are just some of the things that Luse is using or considering using in the next year or so. I see no drawbacks to any of this new technology, especially since I am on my way out and the younger folks almost expect and welcome it. If it’s not available on their phones in the near future, they won’t need or want it. Though the construction industry is perceived as being technologically unsophisticated, it seems like I hear about new tools being engineered and adopted by our customers and peers every day. Most recently, Luse Thermal Technologies has invested in a new estimating software that provides us with a more robust computer take-off program. We are also working to further leverage this software by using it to automate some administrative steps in our proposal-generation process. The drawback to technology integration is the upfront investment required, in terms of both time and money. First, there is the initial cost to purchase or license the technology itself. On top of that is the time required by our team to (1) customize the technology for our specific needs, (2) rework internal processes to incorporate the new technology, and (3) train users on the new technology. Despite the upfront costs, Luse is committed to taking steps to join the digital future. We believe in the return on investment of new technologies that make our business and field operations more efficient. Increased productivity ultimately leads to increased profitability, and that is something that all generations can get excited about. Technology is becoming a large portion of our industry. We now have foremen on projects who are using computers on site to perform all of their paperwork duties, and communication between the office and the jobsite is improving. Our day-to-day operations haven’t changed specifically, but our entire company just seem to be better with the use of cell phones and computers. There is more cell phone communication with texts, pictures, emails, etc. For example, employees don’t have to come to the shop to fill out a time slip. They can fill it out on site, take a picture of it, and send it to the office. The drawback to all this technology is that we still have to perform work safely. You need to have a strict policy on cell phone and computer use on job sites. It’s very easy to lose your concentration on what you are doing when you are dealing with your cell phone. Technology has had a very positive impact on our industry (just like every other industry/business). We are staying pretty current with technology/tools that help increase our productivity. Sometimes, however, it comes with an unexpected cost. Technology isn’t cheap and it is always changing—there always seems to be an added expense. We have converted from paper blueprints/estimating to having everything digital. We have also implemented more security and backup procedures to ensure the integrity and safety of valuable information. The largest drawback we face is the resistance or unwillingness to adapt from some of the more tenured employees. They don’t like change as much and prefer doing things the same old way. To be completely honest, in my 42 years of experience in the insulation industry, most things still work the same way. Fiberglass is still made in 3’ lengths with an ASJ jacket, a PVC fitting is still a PVC fitting, elastomeric still comes in 6’ length and is basically black, PVC and aluminum jacket are basic, and how on earth do you change ductwrap? The core truth is that an insulation product needs to be installed correctly the first time to save the customer money, and possibly even pay for itself. In today’s world that is a challenge for all of us. From our standpoint, technology is having a very visible impact. We have heard over and over how projects are being built bigger, faster, and cheaper. One of the simplest (and most complicated) ways to meet these demands is to be sure the project is done right the first time. With the right technology that is more possible than ever. It is commonplace now to be out on a project where multiple trades have tablets. With a touch of the screen they can bring up schematics, details, or changes that have been incorporated. It can be cost prohibitive to keep reproducing paper copies, so this type of technology frequently saves us time and effort. We can talk to a mechanical contractor and only have to do something once, or we can get an answer that helps keep us moving forward. One issue with this process is that information does not always make its way to a lower-tier contractor in a timely manner. There have been a few small changes in our day-to-day operations. We have tried to streamline how we get information to and from the field, and worked on ways to put fewer burdens on ourselves and for those working for and with us. Technology is one tool we have used to help offset labor costs and create more efficiency. One of the ways we recently achieved this was by changing how we do our payroll and time keeping to create a better flow of information for our business. We were constantly waiting for time cards to come in through the mail or be brought into the office for processing. We would spend too much time calling employees to remind them about it. On the back end, our employees were getting paychecks at different times due to where they lived or what holiday was coming up. It was very frustrating for all involved. We now have GPS clock in from mobile phones that each employee reviews and approves, allowing us to have all hours submitted and processed within a day. Now everyone gets paid at the same time and on the same day. We also feel like it has brought more accountability for our company to help with hours worked on the job. Each week the vendor provides multiple reports that break down jobs/wages, etc. for us. It has freed up our other office staff to put their focus on other areas we need help in. We have also updated our technology, both in the office and in the field. With the time keeping, we wanted all of our employees to have smart phones and email addresses that we could use to pass information on to them. This has helped the message not get lost in translation. It has also been useful to allow employees to reference information as needed. For instance, when you are working multiple job sites, it can be hard to remember what gets covered and what doesn’t. We now send out approved field specs to all employees so they know what gets covered for the various systems we are working on for that particular project. In the office we have updated our computers, software, and equipment to minimize any lag time we were having. It was a small price to pay for some sanity! There are always some challenges in getting set up initially. We were fortunate to work with some really knowledgeable people that were able to take our input and suggestions to create something that worked for us. They also had excellent follow up and never left us hanging for an answer. We have always adhered to the policy that we will try something out, but it has to make sense for our company and create value—either monetarily or otherwise. The technology upgrade accomplished both. Technology has increased the pace at which daily demands need to be met due to the faster means of communication and the ability to be “in touch” nearly anytime and anywhere—I call this the nowhere-to-hide syndrome. We no longer have the grace period allowed when we used to receive or send a fax; now we can scan/send/receive immediately with the use of mobile devices. We have embraced the cloud and project documentation, including all project-management communication between our office and field personnel. We are also keeping up with changes in both software and hardware so that the most efficient and cost-effective means are being utilized. Technology has affected us immensely; I do not see any activity that we do anymore that hasn’t been impacted by technology in our personal and professional lives. Every year we expand email and electronic devices to more and more people in our office and in the field. We have moved almost all our reporting and planning to the cloud to speed up and simplify processes. As a drawback, there will always be people who can’t quite catch on to changes stemming from technological advances. Additionally, there are also people who (no matter their intent) will do something unsafe and there will be times that technology will play into that unsafe act; we’ve made changes to safety policies as a result, but it is the new reality in which we live. 6. Is the availability of skilled tradesmen/tradeswomen affecting your business? The availability of skilled manpower in both the union and non-union sectors is a big challenge. Less young people are looking to construction as a career and it is making it harder to lure them into the industry. Construction worker shortages will affect major job starts and hopefully owners will talk to each other in various regions and coordinate their efforts to try and work through the skilled labor shortage. I’m not sure how the construction industry will solve this problem, but I am confident creative solutions will emerge as we move forward. It has always been our policy to train our own people through our Department of Labor–certified training program. Other companies depend on the union to train their workforce. Either way there is a lack of newer generations going into the construction trades. If you can find people and find a way to communicate with them in their language, you will be ahead of the curve and secure your company’s success. There is definitely a shortage of tradespeople. I think this will be an issue for the long term within the overall construction industry. I think our industry—along with all others—is using technology and engineering to help combat the shortage of man power. We see more pre-fabricated, pre-installed, or pre-insulated items made in a factory, rather than products made on site by a tradesman. We try to make our crews as efficient as possible to help with the shortages. We also try to offer very competitive wages/benefits to our current employees so we don’t lose them. We are blessed with a core group of employees that have installed for 34 years. These guys are still hungry and dependable. They are leaders in helping new hires learn the proper way to insulate. We have not been impacted yet due to worker shortage, but it’s coming for all of us. Sometimes it seems as though younger people don’t want to work really hard or travel too far—they want a 40-hour week and a boatload of money to start. The challenge is not to give up on finding solid people who are worth the risk of hiring. I believe they are out there, and the second generation of our company depends on them. Regarding skilled workers—there aren’t many. We have also seen some unethical recruiting practices. Worker shortages across trades are affecting schedules more than starts. Our work is then compressed/accelerated as the completion dates still need to be met. This complicates our job as our work occurs closer to the end of the project and there is less ability/time to adjust to schedule delays. Off-site/modular construction is already taking place. We need to encourage our customers to be proactive by allowing our participation in this portion of the project to enjoy similar efficiencies. Insulators, skilled ones especially, are in demand now and will remain so until/unless the market slows down. If or when the market speeds up, it will only get worse. We’ve extended our manpower planning substantially to deal with both understanding our needs and allotting time to locate people. At the same time, we’re always looking for new products and processes to simplify the overall project or at least improve efficiencies in part to reduce some of the labor strains. 7. What generational work habits have you noticed in your business? There are a couple of generational work habits that have become clear to me as I see the younger folks come into the industry. First, technology doesn’t scare them. They aren’t afraid to experiment with new programs or apps. They don’t mind pressing buttons even if they don’t know the outcome (I’m always afraid if I push the wrong button I will lose the work I have just prepared, or will cause our whole system to go down with a virus). They actually embrace new technology and are looking for the next new program or app that can help them be more efficient or streamline an old process. Secondly, I clearly see more concern for a work-life balance and a flexible schedule. While my generation gets in at the crack of dawn and feels you must be in the office to be productive, this generation enjoys being able to work from home and be plugged in and productive no matter where they are or what time of day it is. It’s amazing to me how many times I see emails or projects sent to other employees or even clients at all hours of the evening or wee hours in the morning. If they have power or a fully charged battery, they can get work done from anywhere and at any time. I have been encouraged by the way our senior leaders at Luse have been open to ideas and innovations from the younger generation. Young people are eager to have an impact on the business, and it is important that they feel comfortable bringing ideas forward without hearing, “That won’t work… we can’t afford that… we’ve always done things this other way.” Our management team has recently adopted a motto of “Wow! Not How?” whereby we endeavor to give ideas room for development and cultivation. This creates a culture of continuous improvement and trust between generations that is vital to long-term growth. Despite my generation’s quest for technology-enabled quick wins and instant gratification (there’s always an “app for that”) we are often reminded that it’s impossible to build a rolodex or a reputation overnight. I believe that subcontracting will always be a relationship-driven business, and human-to-human relationship management is something I have tremendous respect for. It’s the legacy, brand, and relationships developed by the incumbent generation that have formed the foundation for our company’s future growth. Just like in previous generations, the new up-and-coming generation has the energy and enthusiasm to perform the work. The older generation has always assumed the teaching-of-the-trade position—these times are no different. We are just dealing with different tools. While we still use long-standing tools of the trade, there are now new tools such as smart phones and computers. The new generation will teach the old generation the technology, while the older generation will teach the new generation the trade. While generalities about each generation are usually the case, we have some younger people that have natural relationship skills and have been a great bonus to our company. We also have had some older workers that have a lot of relationships, but struggle to communicate within the company due to a lack of technical skills. There is constant teaching to the younger crowd—they are usually receptive to advice. The older generation, on the other hand, isn’t always keen on learning new skills. Today’s “older generation” has its own strengths in technical tools and technology—after all, these questions are being responded to by a geriatric with a keyboard connected (wirelessly) to a computer (not a typewriter), saved digitally, and transmitted utilizing email—not by pigeon, post, or even fax. Most likely the “younger workers” will do the same. After all, the Baby Boomer generation did pave the way for the implementation and proliferation of technology tools to take hold in the industry. There absolutely is an exchange of skill sets between generations. The issue would be when attitudes get in the way of proactive collaboration—when age becomes the roadblock instead of solving the problem at hand. Everyone at the table should have a voice in the solution and a consensus can then be achieved. The quicker everyone adapts to the above philosophy, the better the team can perform. To a degree, I’ve always believed that some of the generational attributes can be stereotypical. Overall, the youngest generations seem to trust technology to the point of total reliance while some of our more senior generations can swing in the opposite direction. As a member of one of the younger generations, I do wish people from my own generation could develop some of the personal connections that don’t lean heavily towards reliance on a smartphone. Interpersonal skills are hard to teach and we in the younger generations are coming into a world built by those who came before us with a different outlook. The growth in technology has simplified parts of our lives while making them almost oppressively complex in others. 8. Has your company adjusted to recruit and retain the next generation of leaders? As I and many of my senior leaders approach retirement age, it has certainly caused us to take notice and develop our next generation of leaders. We have 1-on-1 sessions with senior leaders and our next generation on a regular basis. We have hired an executive coach to help formulate personal-development plans for our emerging leaders and help them get up to speed faster and navigate the waters of our ever-changing and fast-paced industry. 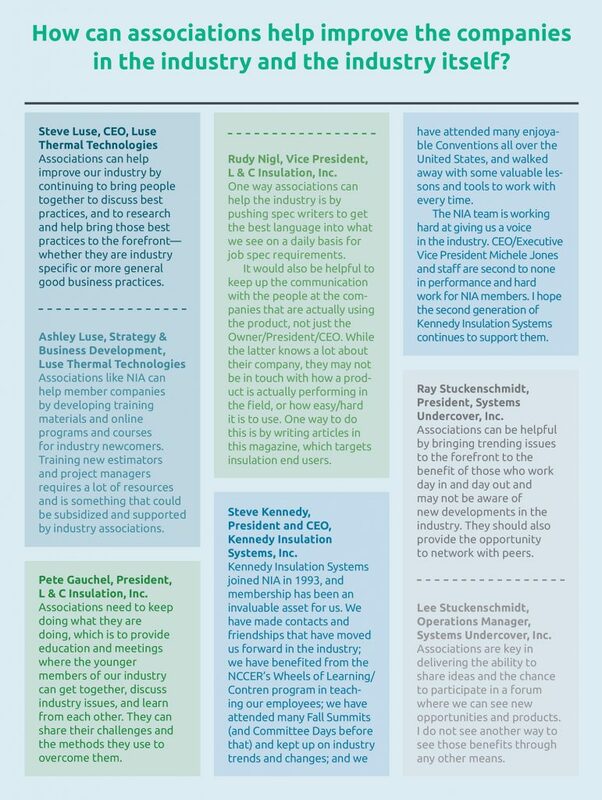 We have also asked our emerging leaders to get involved in local, regional, and national associations like NIA at earlier stages in their careers than we ever did so they can network with colleagues, immerse themselves in the industry, and get the full benefit of what these great associations have to offer. Another thing we have done recently is focusing our recruiting process on younger folks and highlighting many of the things we are doing for our younger employees, including a big focus on our emerging corporate culture and what they can come to expect if they work for Luse or one of our affiliates in the near future. We have recently promoted some young leaders to management roles, and senior management is committed to providing them with the resources and support that they need for success. Candidly, I believe that testimonials from young and emerging leaders within our company serve as a far more powerful recruitment tool than anything we could write in a job posting about our “Millennial-friendly” culture. We are bringing in the next generation and teaching them about our industry and the value of establishing relationships with customers. We are also teaching them the value of being a part of an industry association like the NIA where you can meet other people of the same age who are getting involved in our industry. Our recruitment practices have changed drastically. We used to put ads in the newspaper and recruit people that way—now nobody reads the newspaper. We currently use other internet methods to find new prospects. We have a succession plan in place for the next generation to slowly take over the leadership role in our company. Over a number of years, the current owner has been teaching all aspects of the business and industry to the next leader to prepare for the future and long-term growth/success of the company. We haven’t really changed recruitment practices. A benefit of hiring younger employees is that you can mold them to your company’s specific needs and then, hopefully, they will be around long term. Nearly all of our present management group is in the “Xennial” (older Millennials) or Millennial age group. This move wasn’t intentional, but as senior employees have left, these were the folks ready to step in and step up. Although we would like to promote from within, we have utilized employment agencies to recruit—gone are the days of placing an ad in the local newspaper. We have reviewed benefit plans, implemented flex schedules (10-hour days instead of 12), and don’t work weekends anymore (unless we have to). More by act than design, the average age in our company has been going down, so we have been/are moving toward more technology and more reliance on the next generation. We are a family business, so I could say that we’ve been working on that development for a good portion of a generation. That has its own pitfalls and benefits.